Accurate sizing and placement of Lester Jones tubes is essential to ensure correct tear drainage. Placement of the StopLoss Jones tube is simple using the StopLoss tube introducer system. Using a guide wire the correct track is identified and maintained. 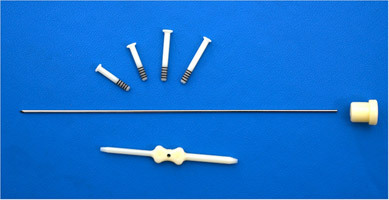 Specially designed dilators are used to enlarge the track and the required size of StopLoss Jones tube can be accurately determined using the patented sizing devices. The StopLoss Jones tube introducer system covers all standard Jones tube sizes and for convenience comes as a pre-sterilised disposable kit. For instructions, user advice and video of the product please click on the Downloads link at the top of the page. Should you later, manually delete the preference cookie then you will need to re-confirm your preference when you next visit this website.